Today is the 400th Anniversary of the death of William Shakespeare. 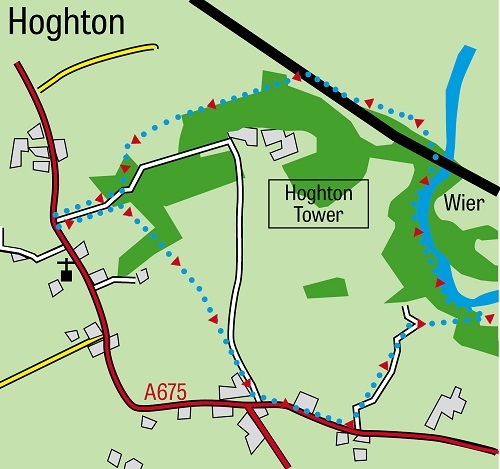 To mark this momentous day here’s a walk from Hoghton Tower. There is a book to be written and perhaps one day I’ll write it called “Shakespeare in Lancashire”. Considering the Bard of Avon is our national poet so little is known about his life. Born in Stratford upon Avon in 1564 he married Anne Hathaway at the age of 18. After this the record becomes thin until the 1590s when he can be placed in London as an actor and playwright. From that point he went onto write 38 plays, 154 sonnets and two long narrative poems before retiring back to Stratford in 1613 three years prior to his untimely death at the age of 52. While evidence of his movements before the 1590s is scant intriguingly some records seem to link him to Lancashire through the Hoghton family. He may have been employed as a tutor or he may have been part of an acting troupe which played at Rufford Old Hall and Hoghton Tower. For my money there is no doubt that the Old Bill was in Lancashire – where would have drawn his inspiration for the heath where the Three Witches meet Macbeth but the West Pennine Moors in easy reach of both Hoghton and Rufford and if you wish to see the place where the ghost of Hamlet’s father appeared forget Ellsinore – go to Hoghton Tower instead. The route described below to my mind is one of the finest short walks in the county and who knows you could well be following the footsteps of William Shakespeare himself! Directions.Cross the road and stand at the entrance to Hoghton Tower. This is one of the most magnificent views in the county. The eye is pulled along and up by the avenue to the castellated outline of the tower. Closer inspection is possible on the numerous days when Hoghton Tower is open to the public. After this pause of appreciate walk along the drive for a little under 300yds to reach a gatehouse and fence. Here turn right and soon after pass through a metal kissing gate. With the fence on your left follow the track as it leads uphill to a patch of woodland. Cross a stile and after another bear slightly right to a stile close to a prominent dead tree. that places you on Green Lane. This quickly brings you to the Royal Oak at Riley Green. Turn left on the A6061 Riley Green Switch Road and walk along it for 300yds (after the pub it will be best to cross to pavement on the other side) to reach an entrance to a drive. through a ribbon of woodland to reach the River Darwen. On reaching the riverside turn left. and beneath imposing railway viaduct of the Preston - Blackburn line. bear left onto a bridleway. over a pedestrian level crossing. Trains pass by with a reasonable degree of frequency on this stretch so take great care crossing it. Through woods opposite you will arrive at the stone boundary wall of the Hoghton Tower estate. as it crosses fields with an open aspect. Indeed the views here are extensive and on a clear day you will have no difficulty in picking out Preston North End's Deepdale Stadium and other less hallowed landmarks. After 600yds you will come to a stile next to a five-barred gate. The lane will take you past some estate cottages and onto the drive of Hoghton Tower itself.